Originally thought to be an urban legend, it is now known that raisins and grapes are indeed toxic to dogs. The type of grape and the type of dog doesn't seem to matter. What's more, the toxic amount may be a small serving to several ounces. Some dogs naturally love eating raisins and grapes and will seek them out—whether stored in the pantry or growing in a vineyard. Pet owners have even used raisins as a training treat, and some have used them as what they thought was a healthy snack alternative for their dogs. A computerized animal toxicity database helped veterinarians see a trend in 1989 by noticing that in some cases of sudden kidney failure dogs shared a common history: the consumption of raisins or grapes just prior to the kidney failure. Stories abound of dogs sickened by raisins including a 66-pound Labrador retriever that became extremely ill when it consumed a 12 oz. box of raisins. The type of grape or raisin doesn't seem to matter, and the amount consumed may be a single serving of grapes or raisins, a single grape or raisin, or a pound or more of raisins or grapes. Raisins, the dried version of grapes, seem to be much more concentrated. Researchers are still trying to determine what the actual toxin is in the fruit that dogs are reacting to. It remains unknown. Some potential possibilities include a mycotoxin (fungal toxin), pesticide, herbicide, or heavy metals. Although, most of these have been ruled out. Vomiting and jittery (hyperactive) behavior are seen immediately to within the first 24 hours after ingestion. Diarrhea may also be seen, and the vomit and feces may contain partially digested grapes or raisins. After 24 hours, the dog may become anorexic, lethargic and depressed. Additionally, the abdomen may be painful, and the dog may stop drinking and urinating. Ultimately, the kidneys fail and without aggressive treatment, many dogs will die. If you are noticing any of these signs, you will want to call your vet or an animal poison control center. There are two to choose from: the ASPCA National Animal Poison Control Center or the Pet Poison Helpline, serving the U.S., Canada, and other regions. There is a fee if you have a consultation with either service. If the raisin or grape ingestion was within 2 hours or less, the veterinarian will induce vomiting to rid the body of the toxin and then administer activated charcoal to absorb any remaining toxin. Aggressive intravenous fluid therapy is required to keep the kidneys in good health. Additional kidney medications may be indicated, depending on the patient. 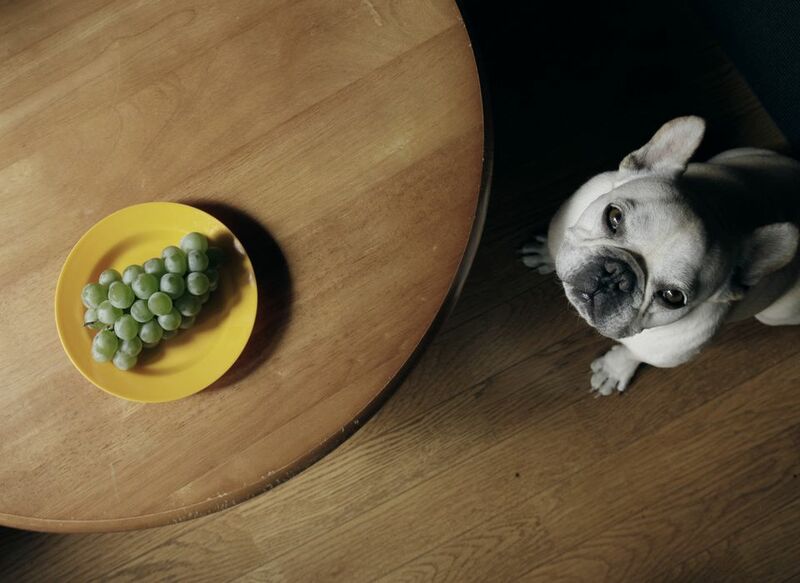 If you suspect that your pet has consumed any amount of grapes or raisins, contact your veterinarian immediately. Although grapes are out of the question, there are a number of fruits that are healthy treats for dogs. You can consider feeding your canine pals banana, kiwi, mango, blueberries, strawberries, watermelon, and apple. Each of these is considered safe and may even give your dogs a shinier coat and boost your dog's gut bacteria.